For the most part, this episode was really predictable. At least seven people watching live on Twitter tweeted that Amy was going to get her revenge for both Holt and Jake assuming she was working for the other side. As soon as we saw the janitor video clip, we knew it was her. But somehow that didn’t detract from the fun of the episode. I think, in part, because there was good character interaction. Holt and Jake’s suspicion of her intent led to Amy proving herself to both of them, claiming in the end that she was her own person and that they needed to trust her. I do have a side-concern, however. When Jake and Holt are trying to get Amy to give up Al the Janitor’s phone number, Jake says "I love you." It’s played for laughs (and he nearly proposes!) and Amy doesn’t seem to think about it too much. Not only was that quick, but it was also a joke. I hope it comes up more seriously later, especially since we haven’t gotten to see much of Amy and Jake’s relationship development. We just know they are together right now. No date adventures or pillow talk (yes, I’m Boyle. I need to know if it’s facing or spooning) or work/relationship balance. I’m glad it’s not the focus of every episode, but I’d like to see just a little bit more. Especially if they are going to throw a fake "I love you" into the mix. Our small B-story: During the heist, Charles introduces Gina to Nadia –– a guy he wants to set her up with. Gina is suspicious the entire time, but just as she warms up to him, she learns he’s the twin brother of Charles’ formerly jailed girlfriend Genevieve! I don’t see this story going very far, so I’m not really invested. But a friend tweeted that it’d be great if Chelsea Peretti’s real life paramour Jordan Peele made an appearance on the show as a suitor for Gina. 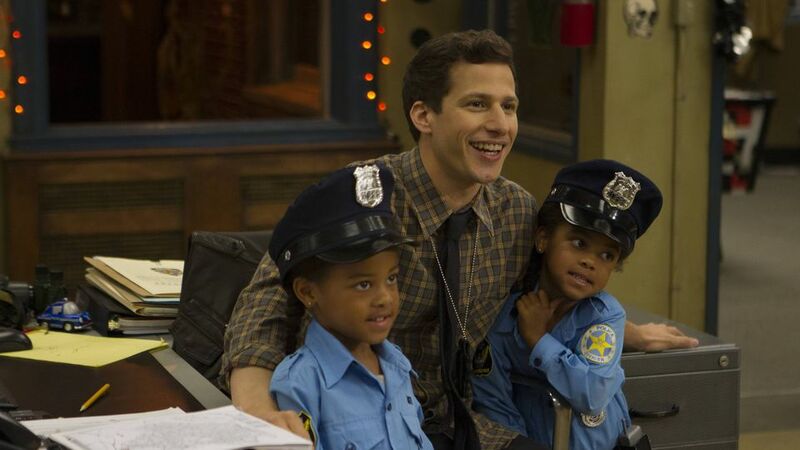 Let’s make that happen, Brooklyn Nine-Nine! As I said earlier, a lot of the episode was predictable, so it’s a short review. But it had a lot of great moments and one-liners. Check the bulletin board below! The costumes! Honorable mention goes to Scully/Hitchcock’s double mustard, Gina’s Bo Peep and Amy’s elf (which included real elf ears). Also, Terry’s Popeye! Perfect! Also, the cold open ruse as a whole, where they dress up and Charles doesn’t (I suppose Jake knew he wasn’t going to and convinced everyone to prank him). Then Charles excitedly goes to change, and the precinct all quick changes back to normal clothing. So great. Rosa somersaulting through the observation room door to steal the crown was amazing. More acrobatics for Stephanie Beatriz, please! I refuse to talk about the cockroaches in Boyle’s pants beyond this one sentence. Holt and Terry’s handshake was golden. The salute that turned into a bird? “Because the cleavage cloaks the camera with its curves. ...Sorry I said cleavage.” Where are Andre Braugher’s Emmy’s for this role? WHERE ARE THEY? Time for the Twin Twist: CAGNEY AND LACEY ARE SO CUTE, I hope we get to see them again, perhaps when Sharon finally gives birth? Then Holt popping up for the photo with his wink? I just want to shower Andre Braugher with awards all day and night. “Alpha team, this is the Golden Sparrow. Rendezvous at Drop Zone Yankee.” Holt almost always refuses to participate when Jake wants code names, but comes up with FIRE code names himself! Golden Sparrow! I wonder if they really only want three Halloween Heist episodes or if we’ll get a fourth next year (yes, I’m claiming a fourth season renewal already). We know trilogies have been adding fourth installments in the movies since forever.